The pond of frog-o’-lanterns really sold me on Dollywood’s Great Pumpkin Luminights. These smiling, bug-eyed squashes squat on lily pads in a small pond between the Thunderhead and Mystery Mine roller coasters, croaking away like a hungry cohort of the real thing. I spent five minutes staring at them, and could’ve easily spent ten more if there hadn’t been a large crowd waiting behind me for their turn at the fence. The frog pond wasn’t the first Halloween display I saw at Great Pumpkin Luminights. It wasn’t even the first that charmed me—there was the disco graveyard before it, a variety of pumpkin people performing different mundane human tasks, and rows of pumpkins carved to look like owls and cats. It was the first that felt like something special, though. And yet by the end of the night it was far from the most adorable or amazing thing I saw at Dollywood’s annual Halloween event. Great Pumpkin Luminights, which runs every night through Nov. 3, stands out among the variety of Halloween options at theme parks around the country. Like Dollywood itself, it’s an unassuming, family friendly treat that’s far more fun and better designed than you might expect. 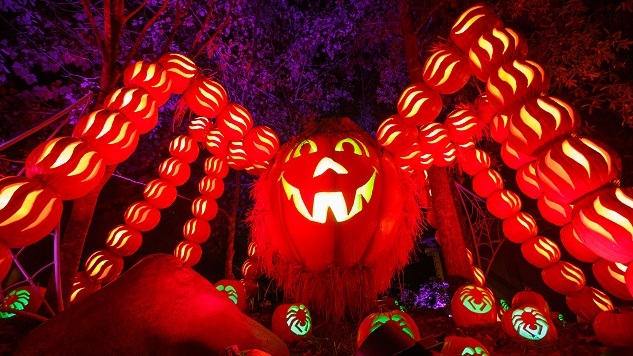 It’s also relatively affordable—instead of buying a separate ticket, as you do at Universal’s Halloween Horror Nights or the Mickey Mouse-hosted Halloween parties at Disneyland and Disney World, entry to Great Pumpkin Luminights comes with a standard Dollywood ticket. So you can show up in the morning, enjoy all the rides and music you care to experience, and then take in the dramatic Halloween displays at night, when they’re most impressive. Luminights also evokes Dollywood’s history of celebrating arts and crafts. Craftsman’s Valley, one of ten distinctly themed areas at the park, features a retinue of actual working craftsman, including blacksmiths, glassblowers and woodcarvers. The various displays during Luminights have a personal, handcrafted appeal, which makes them feel like schoolhouse crafts projects if they were made by talented professionals working with a large budget. I took in Luminights by walking the park’s main loop in a counterclockwise direction, starting at Timber Canyon (where I eventually came upon those frogs) and moving up into Wilderness Pass. It was there, in a plaza where the River Battle water ride sat until last year, that I saw the pumpkin tree. It’s exactly what it sounds like—a Christmas tree, more or less, made up of pumpkins carved into jack-o’-lanterns, and towering 40 feet above the park. Here my family and I took photos with a stately owl mascot with a jack-o’-lantern head, its orange and black plumage designed with the holiday in mind. Similar decorations can be found throughout the rest of the park. There’s a large spider near where Wilderness Pass gives way to Craftsman’s Valley, its body made of a giant pumpkin and its legs made of dozens of smaller ones. It might frighten you if you’re scared of spiders, but its big goofy jack-o’-lantern grin makes it look pretty lovable to me. Near the bald eagle sanctuary, deeper in Craftsman’s Valley, stands a giant guitar made up of carved pumpkins; a musical staff floats behind it, with notes also made of pumpkins. The elaborate pumpkin crafts might have been the main draw for me, but there’s more to Luminights. The sort of stuff your kids might love to do at a theme park—face painting, tasty treats, mascot meet and greets—abounds, but with an appropriate seasonal spin. Halloween-themed treats can be found throughout the park, from pumpkin-spice funnel cakes to candy corn-flavored cotton candy. There are a number of original Halloween characters available for photo opportunities, including that stunning owl creature I had my photo taken with. Glow-in-the-dark paint makes face painting light up even more. And if you just want to ride the rides, including Dollywood’s roster of wicked roller coasters, most attractions are in service during the event. This was my first trip to Luminights, but it’s not hard to see why Dollywood made it twice as big this year. After last year’s debut, it made sense to devote even more of the park to the Halloween fun. And if the crowd was any indication on the Saturday I went, it’s as popular as ever this year. After a surprisingly slow afternoon, the park quickly grew crowded as the sun set and the Luminights revelers turned up in force. Don’t let Dollywood’s lower prices or unique location in Pigeon Forge, Tennessee, give you a wrong impression. This is a world class theme park, and Luminights is a world class theme park Halloween party. And, if you’re like me, you can just sit and stare at those frog-o’-lanterns until November rolls around.